And now that all of the Christmas presents have been opened, I can share the things I've been working on! 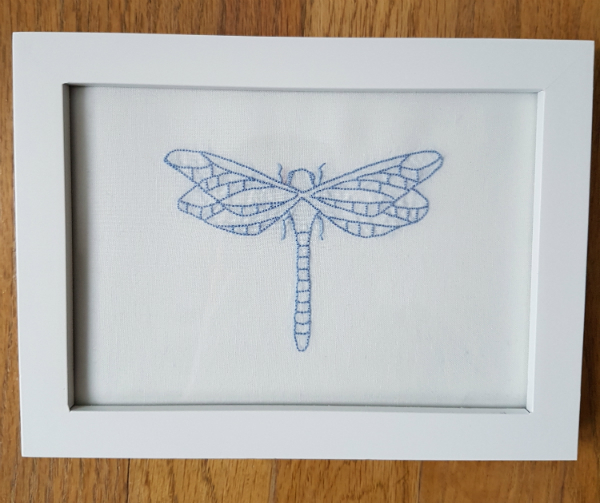 First up, I embroidered 3 dragonflies for my mom. They're all done with only backstitching, which I found to be soooo relaxing. 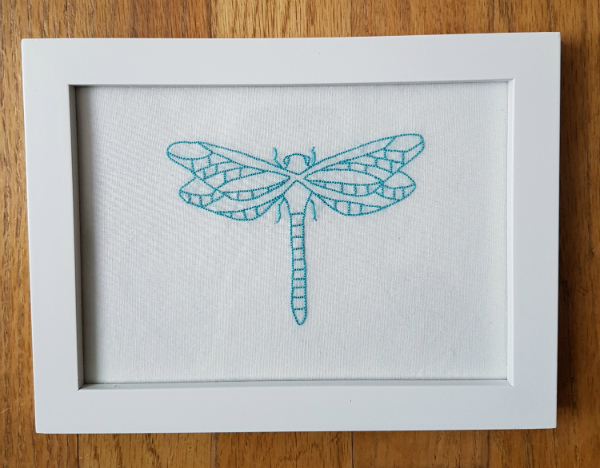 The pattern is from I Heart Stitch Art. 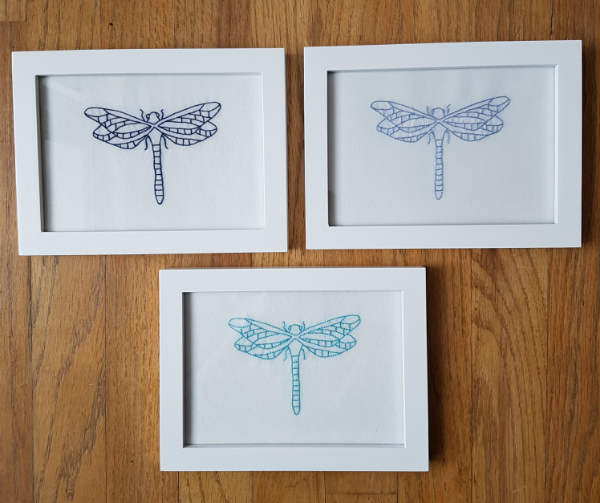 I stitched all three of them using Aurifil 12 wt thread, in colours 2784, 2720 and 5005. I loved them all! Every Christmas I make each of my boys a special ornament that reflects their year in some way. You can see previous years' ornaments here. Aiden is still all about music this year. 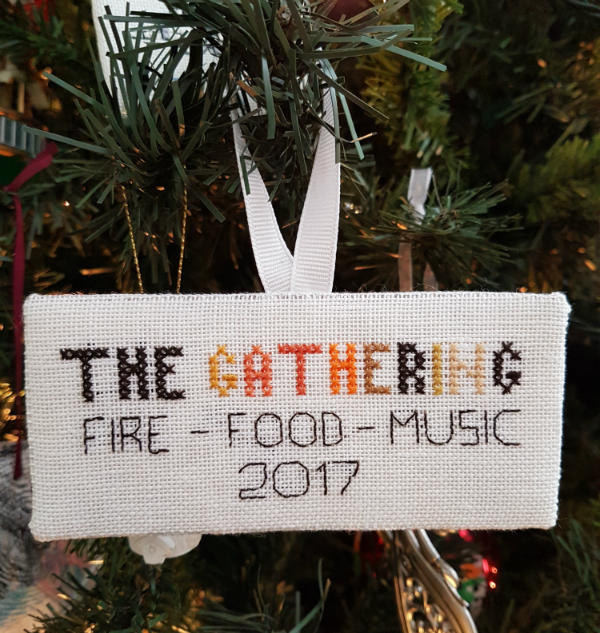 He played in a music festival during the summer, called The Gathering. He and some friends were the band for a local musician and it was Aiden's first time playing at something other than school or church. Around this time last year, Nathan started walking with a man who walks his beagle, Gertie, past our house most days. They walked together throughout the whole year and Nathan even went with Shaun on the bus he drives a couple of times. Now he considers Shaun to be one of his best friends. 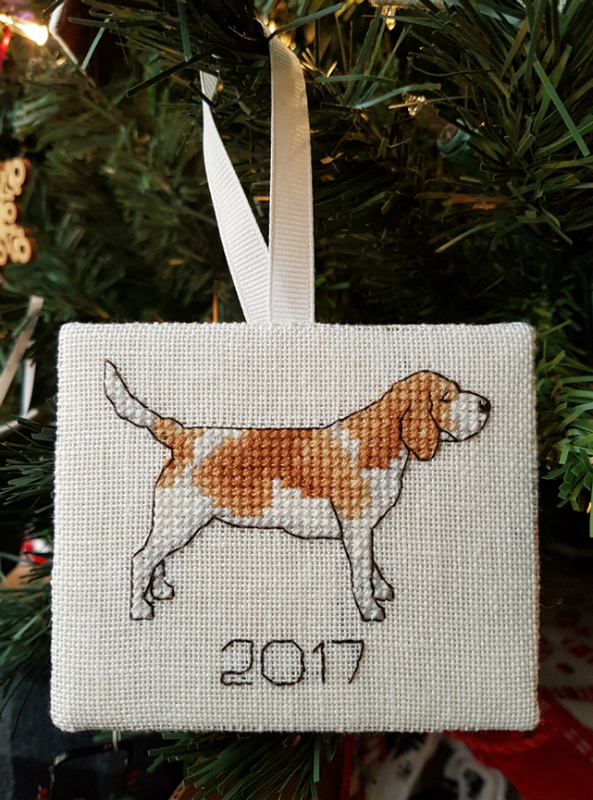 This cute beagle pattern is by Lucie Heaton. 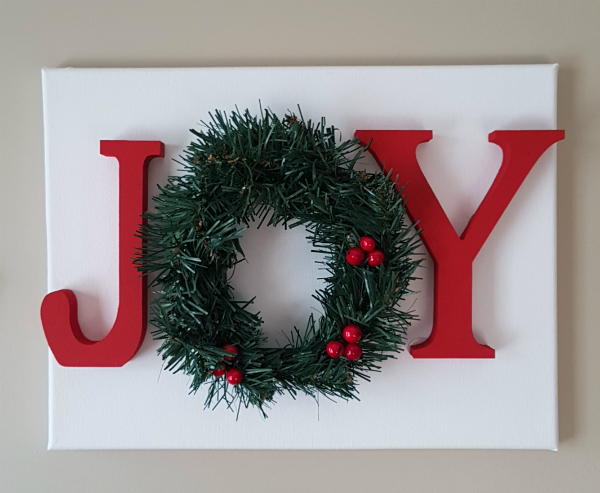 I made two of these cute "joy" signs, one for me and one for a friend. It's my adaptation of a tutorial by Ashley of Make It & Love It. I used a canvas and painted my letters, rather than using metal letters and boards for the background like she did. 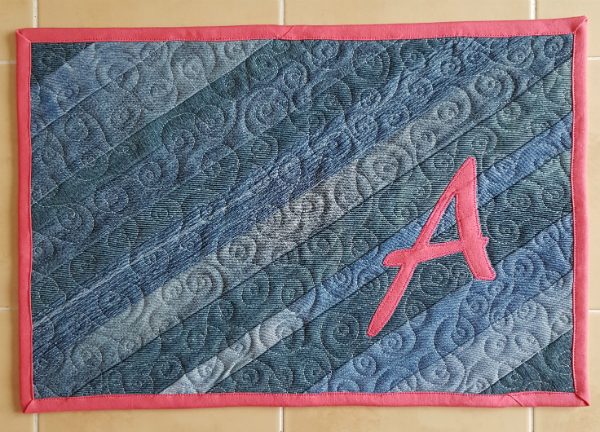 I was pleased with how it turned out, and it was much faster than making a quilt, lol! 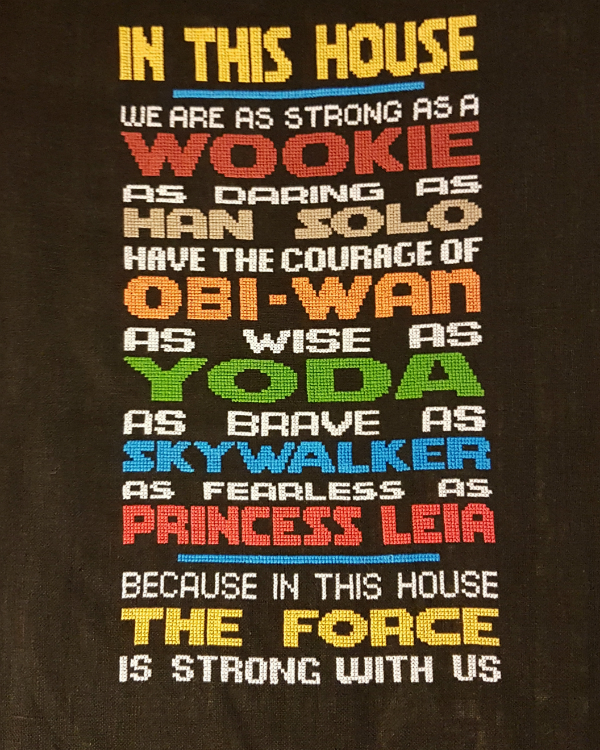 And last is this cross stitch I made for my husband. As soon as I saw the pattern, I knew I had to make it for him! It was really hard to find time to stitch it secretly, but I managed to get it done 😊 I gave it to him unframed and he'll pick out the frame himself. For the record, cross stitching on black fabric is nearly impossible! I needed to have a white piece of paper on my lap all the time, and sometimes I even needed a light under the paper, in order to be able to see the holes in the fabric. The pattern is by Lucy Smith of Crazzzy Stitch. Phew! 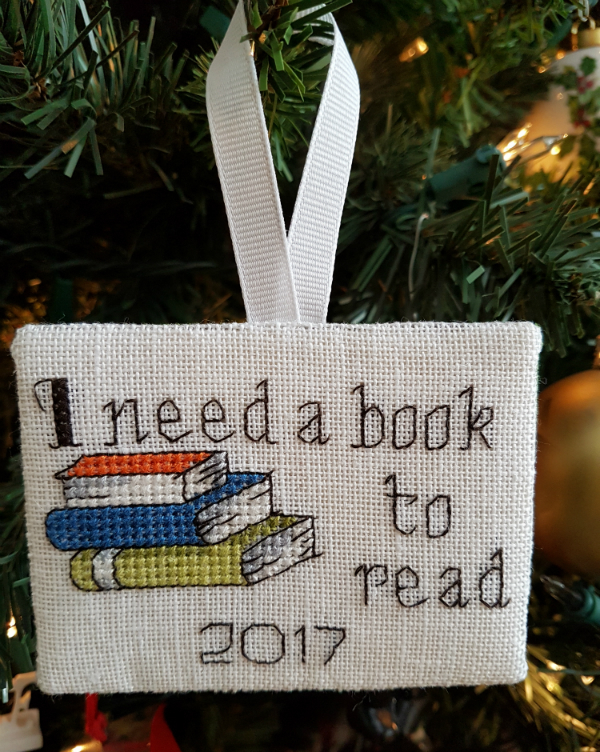 With all that hand stitching, plus the fidget blankets I made, I ran out of time to make the ornaments I planned to make. Of course, that could have been solved if I had made all of my ornaments in time for the blog hop back in July, but oh well. Maybe next year! Did you make any gifts this year? Or did you run out of time and not make something you planned to make? It's the last Sunday of Advent!! I decided to post this week's devotion a day early so that it is published during Advent (the lead-up to Christmas) rather than on Christmas Day itself. 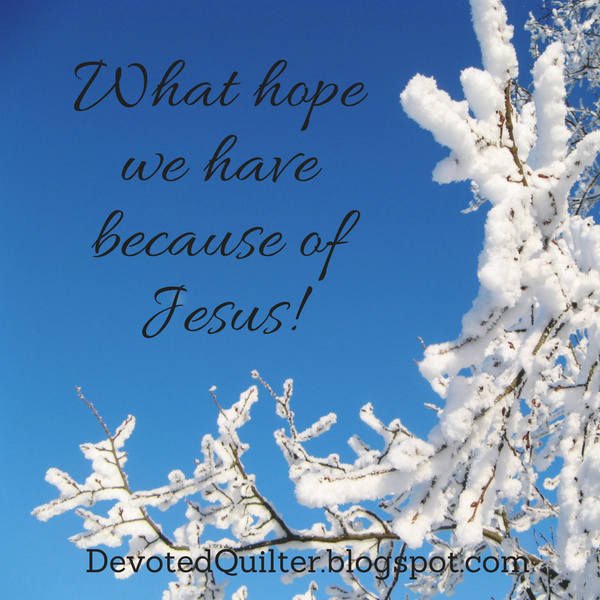 So far this year, we have looked at the hope, peace and joy we have because of Jesus. Today we are looking at love. When we love someone, we often sacrifice things for that person. Maybe we sacrifice time doing something we want to do in order to do something they want to do. Or maybe we don't buy something we want because we need that money in order to buy something they need or want. If you are a parent, you understand this concept of sacrifice quite well. For our kids we give up everything from nights of unbroken sleep to the keys to the car, depending on the age of our kids. We give up hours and hours of our time to help with homework or taxi them to the places they want to go. We buy them new jeans every couple of months because their legs just.won't.stop.growing and we can't have them walking around with their ankles showing. Now, just for a moment, think about what Jesus sacrificed in order to be born in Bethlehem. Paul wrote, "In your relationships with one another, have the same mindset as Christ Jesus: Who, being in very nature God, did not consider equality with God something to be used to his own advantage; rather, he made himself nothing by taking the very nature of a servant, being made in human likeness" (Philippians 2:5-7). Think about this for a moment: Jesus was not limited by a human body until he came to earth for us. Imagine what it would be like to never be limited by fatigue, hunger, thirst, pain or sickness. That is just part of what Jesus gave up to come here. I have been sick with a head cold all this past week. It has been driving me crazy because there are so many things I want or need to do, but I just haven't had the energy to do much. Then it hit me: Jesus probably suffered head colds while He was here. We don't often think about Him putting up with the problems caused by sickness, but I can't see how He would have avoided it for all of His 33 years. Sure, a head cold is a small thing to put up with. But Jesus left heaven, where there is no sickness, pain, death or crying, and came here to earth where He had to deal with all of those things. So in your worst moments, when you feel lonely or like no one cares, know this: Jesus loves you. He loves you enough to have given up all of heaven and to have taken on all the infirmities of these human bodies, just so He could come and save you. That is the true reason for this Christmas season! 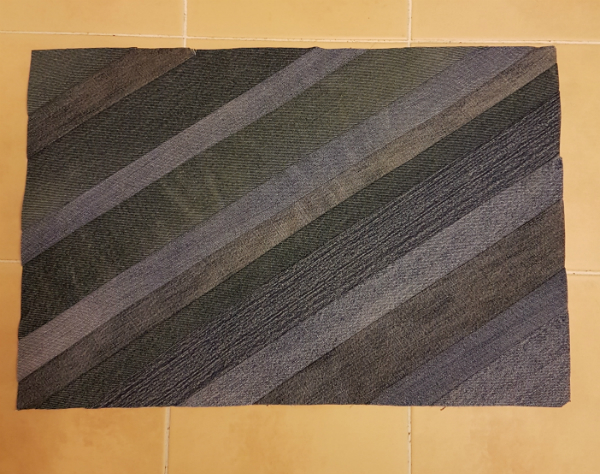 I was asked to make two fidget blankets for boys with autism. 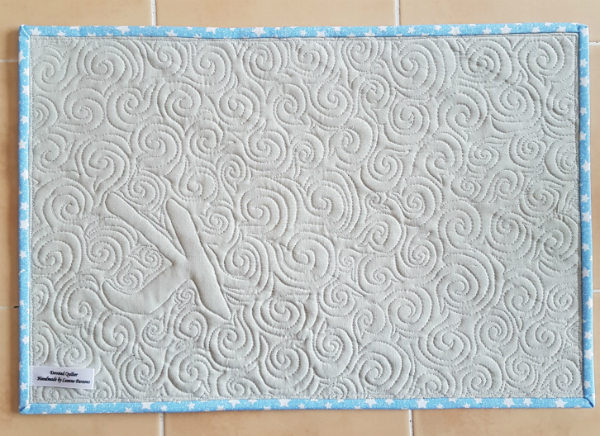 I had never heard of fidget blankets before, but a little research on Pinterest showed me there are lots of options for things to include. And off I went! 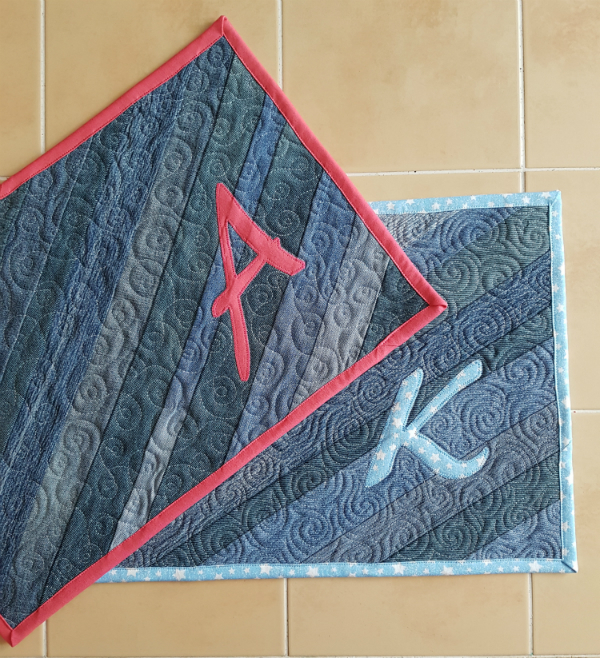 The blankets are 12" x 18", which seemed to me like it would be a good size to include a few activities without getting so big it would become hard for the boys to hold or carry around. I also decided to have them roll up and close with a button and loop (well, actually, it's a hair elastic 😊). 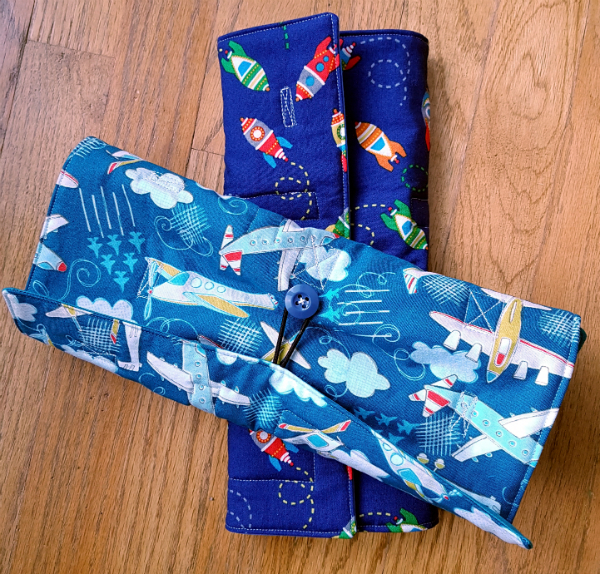 I used fun prints for the outide, rockets for one and planes for the other. I used solids for the inside. With all the different pieces and parts, I felt like prints would have made it feel chaotic. I layered the front and back together with batting and stitched, then turned them and stitched around the edge again. 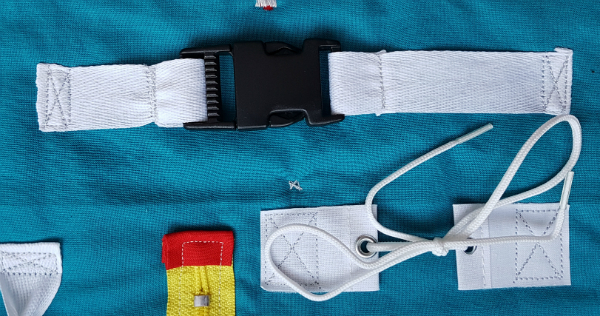 I didn't want a binding because I wanted to use the elastic to hold it closed. 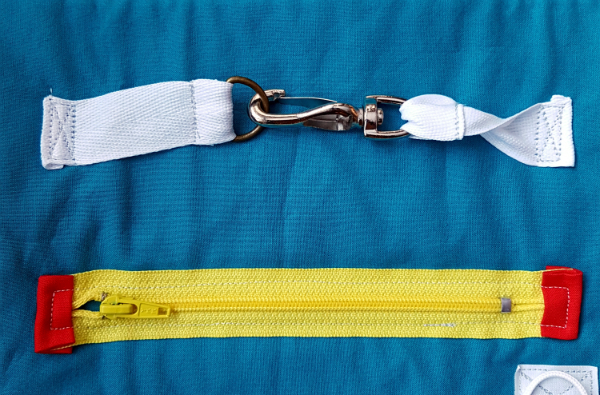 These ribbons are for weaving. 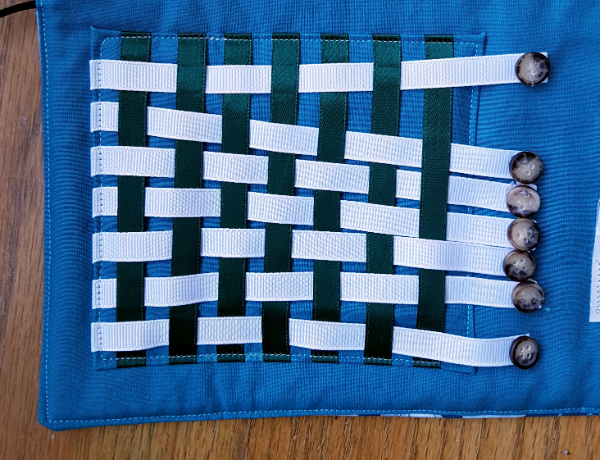 The green ribbon is sewn in place at both ends. The white one is only sewn in on the left and I hot glued a button to the loose end to make it easier to hold. 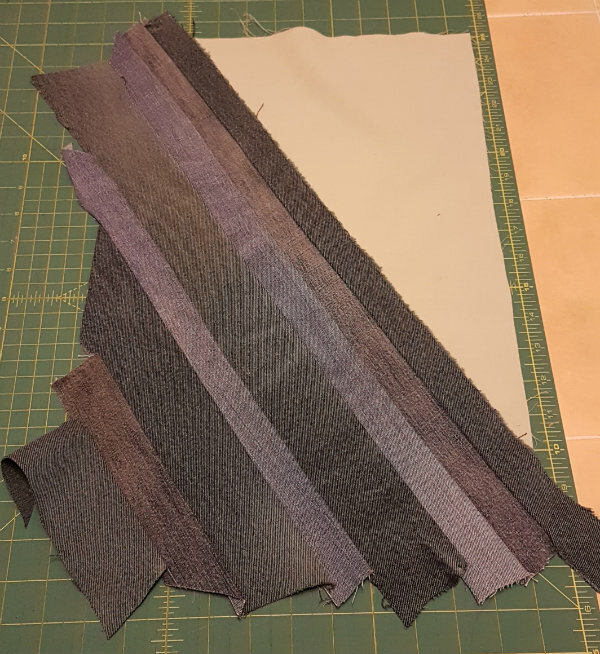 I sewed the ribbons to a square of the background fabric, then folded the edges back and stitched it down on the background. I found these eyelet tabs at the hardware store too. They saved me from having to make something to hold the shoelace. That black clip is called a parachute clip, which I didn't know until I found them at Wal-Mart. A button panel. 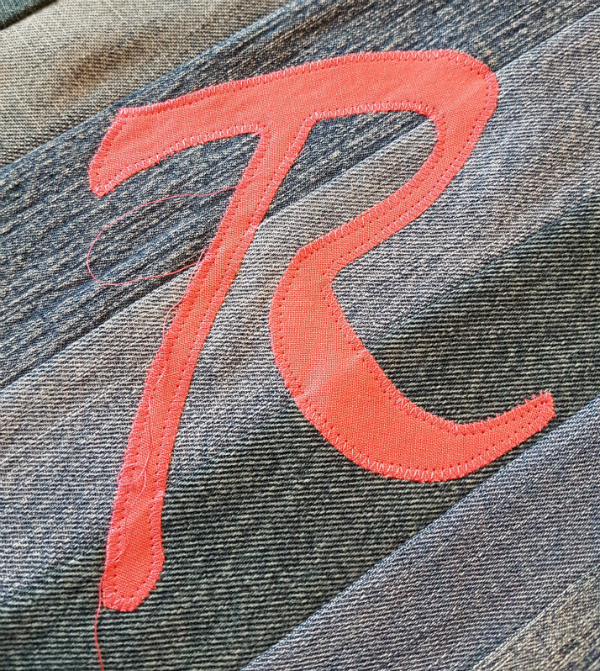 This was the first time I used the automatic buttonhole maker that came with my sewing machine and it worked like a charm. And if you're going to undo a button, there should be a fun little surprise under it, right? 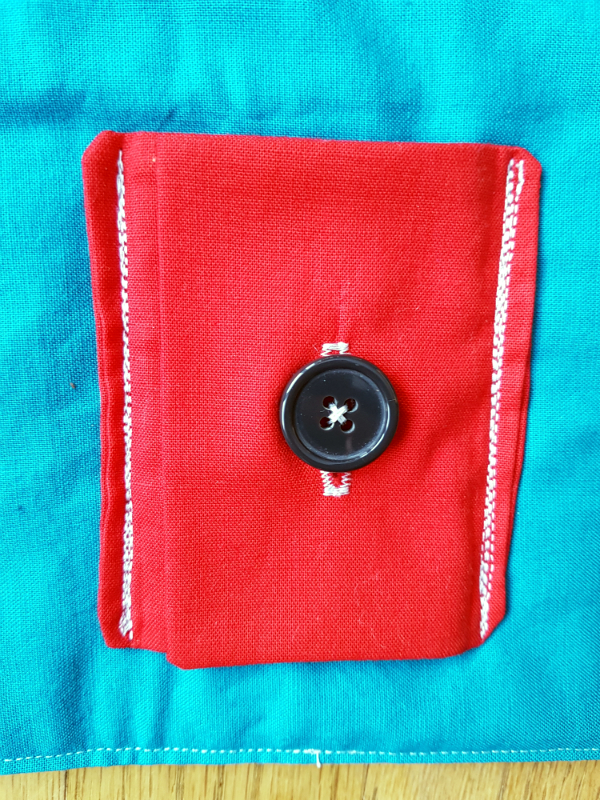 I cut a small piece from the outer fabric and appliqued it under the button panel. 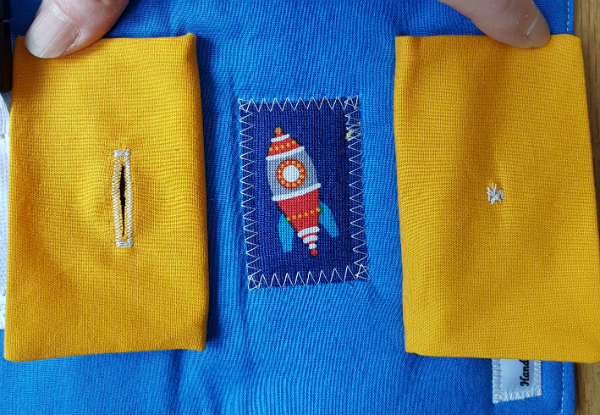 A little pocket with a bit of velcro. Again, if there's a pocket, it seemed like there should be something in it. 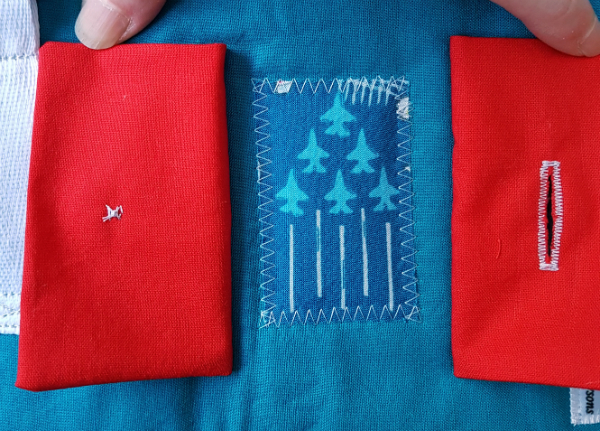 I made a tiny quilt with a star in the middle, then attached it to the pocket with another ribbon so it won't get lost. And last, but not least, a button on (yet another) ribbon. This one slides back and forth. I hope the boys enjoy their Christmas presents! Only one week left until Christmas! So far this Advent season, we've looked at hope and peace. Today we will look at the joy we have because of Jesus. I want to start by saying that joy is not the same as being happy all the time. No one can be happy all the time. There are seasons of grief and trouble in life and there is no way to avoid them, as much as we would like to. Joy sits deeper than happiness, below our circumstances and it isn't affected by what is going on around us. The part that really resonates with me is "Whatever my lot." Whatever comes my way in life, whether it is good or bad, it is always well with my soul. Why is it well with my soul through everything? Because of Jesus! Because of His sacrifice for my sins, I know that, no matter what happens to me, God's grace covers me and I will spend eternity in heaven with Him. That is the source of our joy. Even when we're grieving the loss of a loved one, or dealing with a diagnosis that has us reeling, we can know that we are secure in Jesus. That doesn't mean we won't cry in our grief, and it doesn't mean the diagnosis won't scare us, but it does mean that even in the midst of those things we can have joy. Independent of our circumstances, our joy comes from Jesus. This is really important for us to understand. If we only associate joy with being happy, then we'll assume we can only have joy when things are going our way. But if joy is something deeper, if it is caused by the security we have spiritually because of Jesus, then our joy can be our strength through those hard seasons. When the angel appeared to the shepherds, he said, "Do not be afraid. I bring you good news that will cause great joy for all the people. 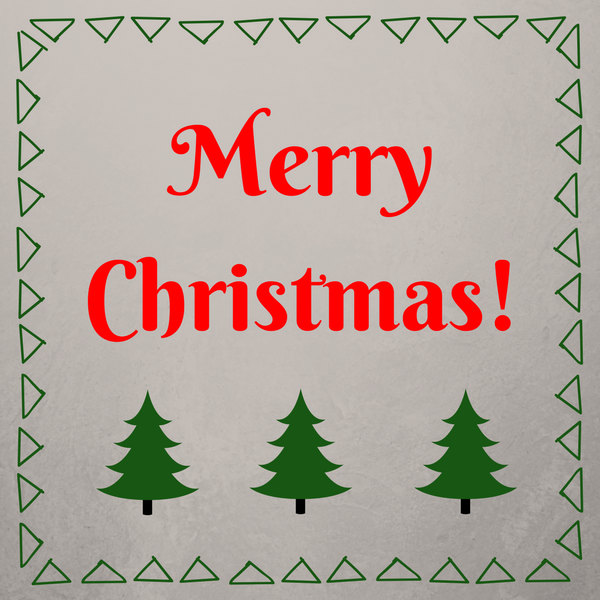 Today in the town of David a Savior has been born to you; he is the Messiah, the Lord" (Luke 2:10,11). The news didn't cause great joy for all the people because their circumstances were suddenly and forever made perfect so they'd never have trouble again in their lives. Not even close. The angel proclaimed great joy for all the people because of the birth of Jesus. Because He had come into the world to bring us back into relationship with God and set us free from sin. Whatever our circumstances this Advent season, we have joy through Jesus because it is well with our souls. Welcome to my stop on the Last Minute Christmas Projects blog hop, hosted by Jen of Faith and Fabric! If this is your first time here, then an extra big welcome to you 😊 If you're interested, I'd love to have you sign up for The Bulletin, my monthly newsletter. 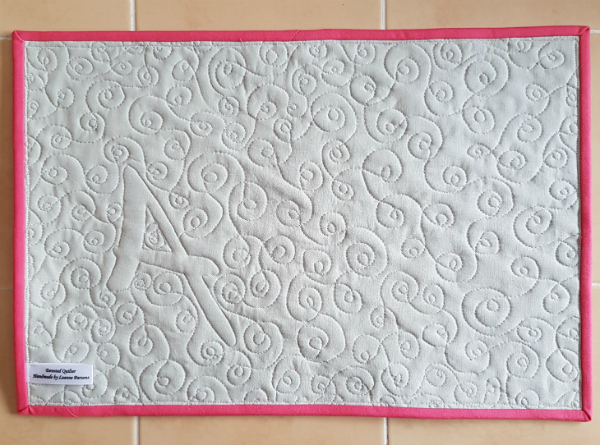 When you do, you'll also receive a copy of my Wind Farm quilt pattern, available exclusively to subscribers. I have a different sort of project to share today. It's something my mom used to do for my younger cousins and I've been doing it for a few years for some of the little kids I babysit. We just call them packages, for lack of a better name. 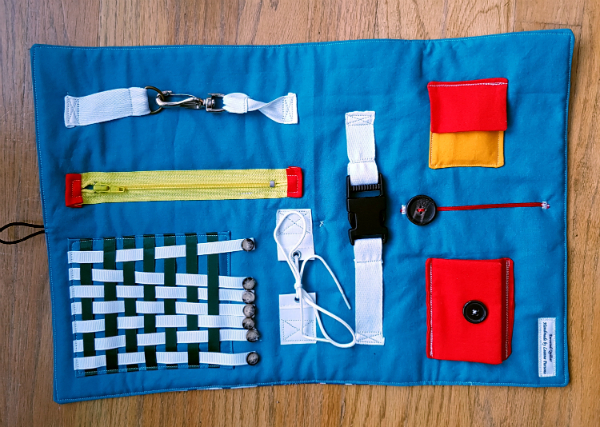 It's not a sewing project, though I like to include handmade things in them. 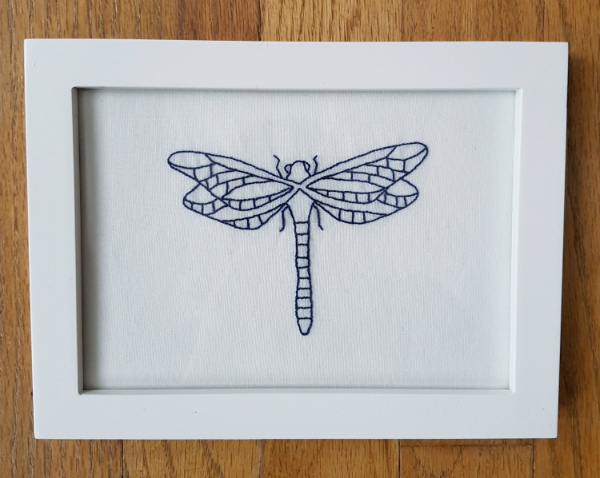 You know when you want to give a gift, and it has to be small (money-wise), but you still want it to make an impact? These packages are the perfect answer. It's not so much the gift itself that makes the big impact, though. It's the delivery! The packages are a bunch of small gifts and the idea is that the kids open them, one at a time, over the days leading up to Christmas. Mom used to do 7 days of gifts and I do 5 days, starting on December 20th. You know those days when the kids are practically dying to know what Santa is bringing them and they just want to open ALL THE THINGS? That's when they're allowed to open the packages. 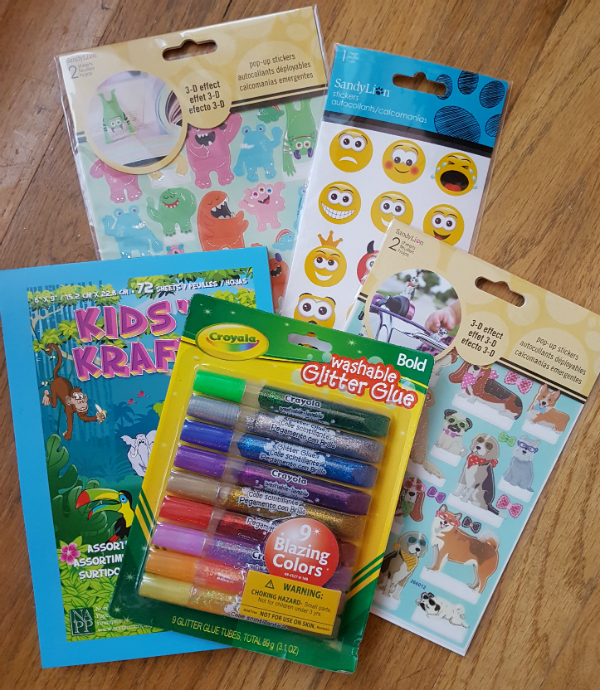 I've heard from the moms of kids I've given these packages to that they were up, asking if they could open "Leanne's present" at 6 in the morning, then spent the next hour making puppets from the kit they opened. I love it! Sure, the moms might not like it so much at 6 in the morning 😀, but the kids sure enjoyed what I gave them, more than they would have if they opened the same gifts on Christmas morning along with everything else. 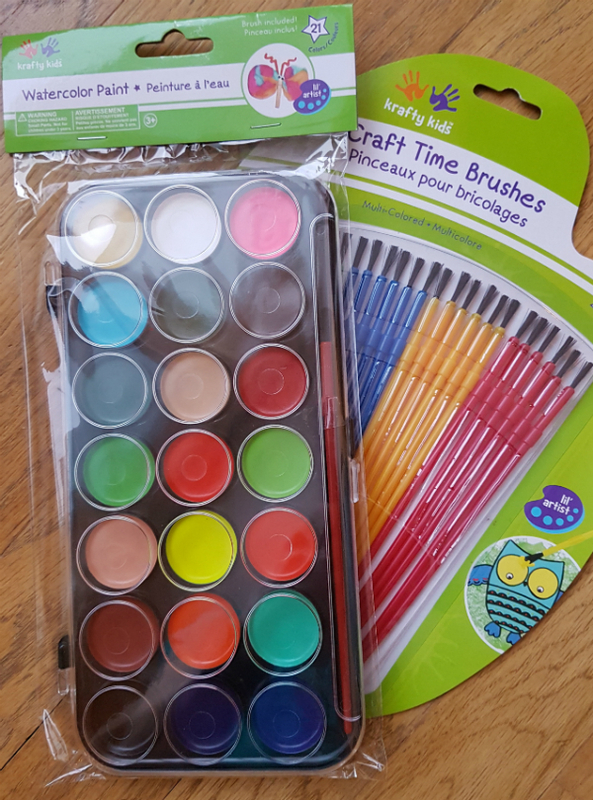 I usually aim for a lot of the gifts to be things to do, like art supplies, craft kits or colouring books. 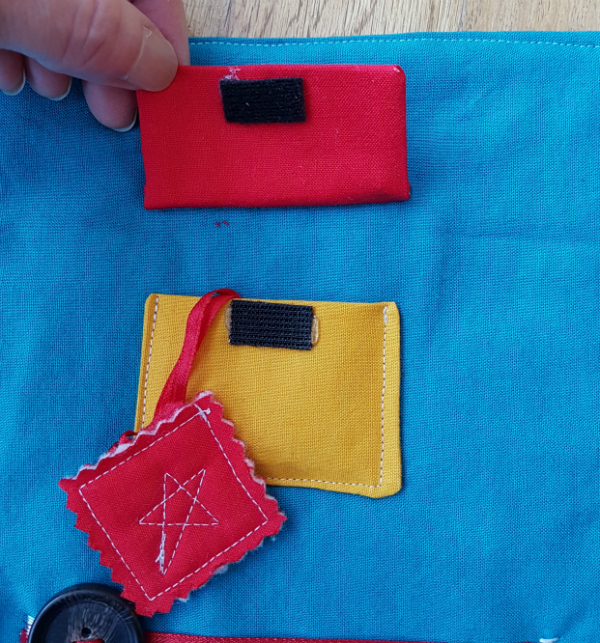 I also like to include something handmade, like this play alphabet or this bean bag toss game. Day 1 - homemade playdough. I use this recipe to make my playdough and it is so, so soft. It also lasts for months when stored in a zip-top plastic bag. I think I've included play dough every year I've given the packages. Day 2 - watercolour paints and brushes. 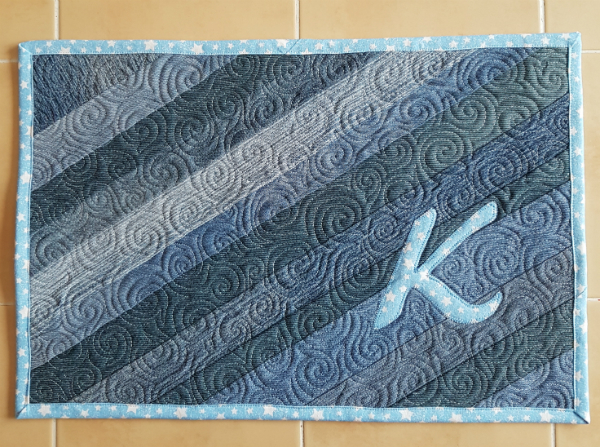 Day 3 - the personalized placemats I've been working on, along with a little treat to enjoy so they can use the placemats right away. Day 4 - stickers, paper and glitter glue. Day 5 - refrigerated cookie dough. This last gift is always the same, and I make sure to explain to the moms that the gift marked 'day 5' needs to go in the fridge right away until it's time to open it. I've thought about making jars of cookie ingredients, but that seems like I'd be giving the moms more work. This way they only have to heat the oven and scoop the dough onto the pan. Keep it simple for Christmas Eve, right? Just as a note, I don't do packages for kids younger than 3, unless they're the younger sibling in a family already getting a package. The younger kids just don't have that same anticipation about Christmas yet and they don't get that opening a present early is extra special. Likewise, I find kids tend to outgrow my packages, but that's only because of the gifts I choose. You could certainly choose 'older' gifts and keep the fun going as the kids get older if you wanted. Technically, this isn't a last minute gift, since you have to be thinking ahead enough to have it ready a few days before Christmas, but it doesn't take much work. Most of the gifts are from the dollar store, or they're things I make myself, so there's not a lot of running around to do to get it all ready. Plus it's so much fun to hear about how excited the kids were to open each day's gift and how much fun they had using it. There are lots of other last minute gifts being shared in the hop, so be sure to check them all out! So, are there kids on your list who would enjoy getting to open some presents early? Packages are definitely the answer! It's the second week of Advent! Last week, for the start of Advent, we looked at hope. This week we're looking at the peace Jesus provides. I've read a lot of references lately to something known as "imposter syndrome." Have you heard of it? Basically, it's the feeling that you don't actually know what you're doing in your work, accompanied by a fear of being exposed as a fraud. What I find interesting is that everyone seems to have it, to some degree, even people who are wildly successful in their fields. Imposter syndrome often manifests itself as that little voice in your head that says, "You're not good enough." There are lots of variations of what the voice actually says, but they all boil down to the same thing - you're not good enough. And with that thought comes the fear that people would laugh at you or turn against you if they knew the truth about you. We Christians have our own, slightly different, version of imposter syndrome. Instead of feeling like we're not good enough in our work, Christians may feel inadequate because of our sins. Whether it is sin that happened before we accepted Jesus as Savior, or sin that happened after, those memories stick in our minds and play over and over, reminding us of how we do not measure up to God's standard of perfection. Those thoughts rob us of the peace Jesus promised us. "Peace I leave with you; my peace I give you. I do not give to you as the world gives. Do not let your hearts be troubled and do not be afraid" (John 14:27). "Therefore, there is now no condemnation for those who are in Christ Jesus, because through Christ Jesus the law of the Spirit who gives life has set you free from the law of sin and death" (Romans 8:1,2). No condemnation! None. God is not sitting in Heaven, shaking His finger in anger at us for the things we have done in the past. In fact, once we have asked for forgiveness, those sins are gone and He does not ever hold them against us again. Isn't that an amazing thought? Jesus came to earth as the baby we celebrate at Christmas so that we could escape the condemnation of sin. Because He came, and because He died for our sins, we are no longer condemned by God for the sins we have committed. That fact is the perfect shut-down for the voice that tries to rob us of our peace by reminding us of our sin. We do not stand condemned. Because of Jesus, we are set free. What peace that will bring to our minds! It's Advent season again! Like so many others, I love this time of year. I love the decorations, the tree, the food and the music. More than anything, though, I love the reason we celebrate. Everlasting Father, Prince of Peace" (Isaiah 9:6). Jesus came as a baby, born into this world to bring hope to a people who were completely hopeless. I'm not talking about the Jewish people, though they were hopeless under Roman rule at the time. I'm talking about the entire human race. We are, after all, one people. Though we've divided ourselves according to religious and national differences, we are really only one people and Jesus came to rescue us all. I've been thinking about it like this: one of the little girls I babysit is named Edie. She's 18 months old and she loves to sit at my kitchen table and play. Sometimes, she wants to play with our Little People barn or one of our big Tonka trucks, but they're too big for her to get onto the table herself. She picks it up and tries to get it that high, but she can't do it, and by that point she's in such an awkward position that she can't put it down either. That's when she starts calling out for me. "Help, help, help, help," she'll yell over and over until I come and take the toy from her and set it on the table. We were like Edie. We had a burden too heavy for us to lift and impossible to put down. That burden, of course, was sin. Romans 3:23 says, "for all have sinned and fall short of the glory of God." All. There is no one who can say they have never sinned, except Jesus. That's what makes it possible for Him to remove that burden of sin from us and set us free. Verse 24 goes on to say, "and all are justified freely by his grace through the redemption that came by Christ Jesus." That is the hope that came to us as a people when Jesus was born in Bethlehem. That is the hope still offered to so many who are struggling in their sin, not knowing or not willing to accept that Jesus came to take their burden. Without Jesus the entire human race was hopeless, without a way to escape from sin. But with Jesus? What hope we have!